If your skin bled in the shower, you would be very concerned. Yet, when they notice bleeding while brushing their teeth, many people ignore the issue entirely. To protect yourself from tooth and bone loss, learn some important facts about periodontal disease. Also known as pyorrhea, periodontitis or gum disease, periodontal disease is caused by inflammation of the tissues surrounding the teeth. Periodontal disease is thought to be caused by microorganisms, which stick to the surface of teeth. Combined with our body’s natural immune response, these bacteria can cause infections that can destroy the structures that support the jawbone and teeth. If left untreated, bone and tooth loss can occur. Chronic periodontitis: This is the most common form found in adults, although it can occur with children too. Chronic periodontitis occurs when plaque builds up on the teeth and causes the slow deterioration of bone and gums over time. Aggressive periodontitis: Fairly rare, this usually starts during childhood or early adulthood. It tends to impact entire families and causes a rapid progression of tooth and bone loss. Necrotizing periodontal disease: This results from a lack of blood supply, which causes the death of the gum tissue supporting bone and tooth ligaments. Necrotizing periodontal disease usually occurs in people who have suppressed immune systems, due to cancer treatments, HIV infections or malnutrition. As previously stated, traditional periodontal disease begins when bacteria are allowed to flourish within the mouth. Experts believe that our bodies react to these bacteria by staging powerful immune responses that promote inflammation. In time, this inflammation causes a range of troublesome symptoms and, ultimately, tooth and/or bone loss. Changes in the way your teeth come together when biting. What Are the Stages or Periodontal Disease? Gingivitis: During this earliest stage of gum disease, inflammation begins as plaque builds up around the gum lines. At this point, a person may notice bleeding and gum sensitivity while flossing or brushing. If caught during this stage, periodontal disease can be reversed, since connective tissue and bone remain unharmed. Periodontitis: At this point the supporting bone and tissue that keep teeth in place have become irreversibly damaged. Gums may start forming pockets below the gum line, allowing food and bacteria to accumulate. That said, with proper oral hygiene and dental care, further damage may still be prevented. 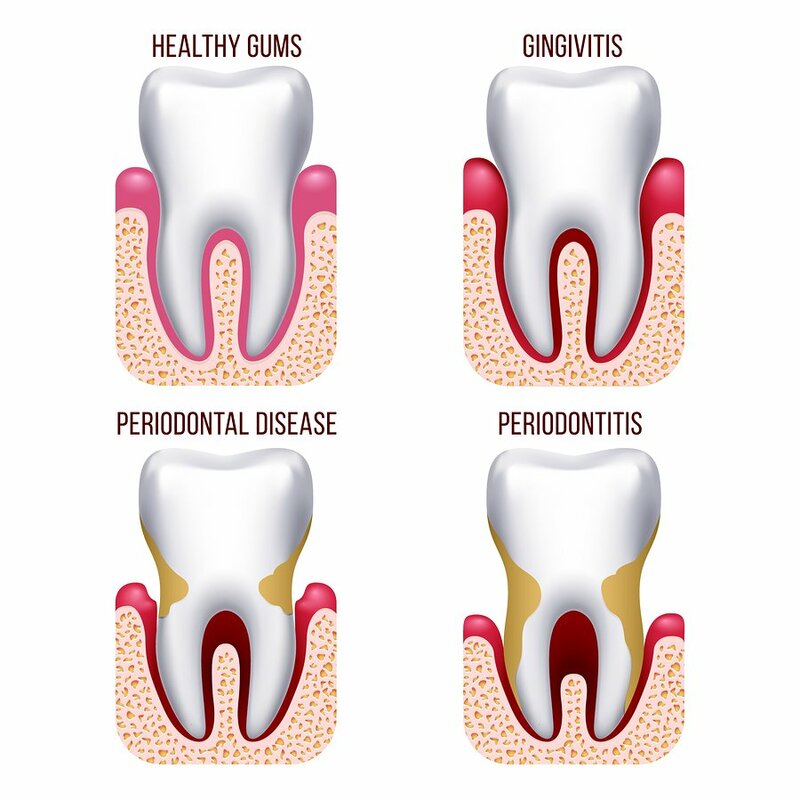 Advanced Periodontitis: During this final stage of gum disease, the bone and connecting tissues are destroyed, causing teeth to loosen or shift. If aggressive treatments prove unsuccessful, teeth may need to be removed. If performed in time, the right periodontal procedures can preserve bone and teeth. Treatments range from surgery to restore supportive tissues to nonsurgical therapies that reduce bacterial growth. Your dentist may recommend a professional dental cleaning, along with scaling and root planing to remove plaque and tartar from deep beneath the gum lines. Depending on the progression of your gum disease, a dental surgeon may need to perform flap surgery/pocket reduction surgery, bone and soft tissue grafts, bone surgery or guided tissue regeneration. Whatever the case, your prognosis drastically improves if a dentist is able to catch your gum disease in its early stages. That is why it is so important to get regular checkups to look for even the smallest sign of bleeding and/or inflammation. You have signs of gingivitis. You smoke cigarettes or use chewing tobacco. Your oral hygiene habits have been poor. You’ve undergone menopause, pregnancy or some other issue that can cause hormonal changes. You are engaged in or have a history of substance abuse. You have a genetic history of gum disease. You take medications that can cause dry mouth. You have rheumatoid arthritis, diabetes or Crohn’s disease. You have HIV/AIDS, leukemia or are undergoing cancer treatments. According to Centers for Disease Control and Prevention, nearly half of all adults over the age of 30 have some type of periodontal disease. That amounts to millions of people who risk tooth and bone loss, along with other potentially-serious health problems. If left untreated, periodontal disease can reduce the quality of your life in a number of ways. Without teeth, it can be difficult to eat a healthy diet, which can result in health issues due to malnutrition. What’s more, research suggests that bacteria responsible for periodontitis could possibly enter your bloodstream through gum tissue and cause problems in your lungs, heart and other organs. According to the American Dental Association, researchers have drawn links between gum disease and cardiovascular problems, including heart attack and stroke. For these reasons and many others, it’s a good idea to watch closely for signs of periodontal disease. You should also prioritize oral hygiene and visit your dentist regularly to check for signs of bleeding and inflammation.